Kim’s talk will be illustrated by images created by the Lewes photographer James Cheetham (1854-1941). She will also explain how near Cheetham’s collection of glass negatives came to being lost for ever. They were saved only by a remarkable sequence of coincidences. As usual the meeting will be held in the King’s Church Building, Brooks Road, and all are welcome. Note that pedestrian access from the Tesco car park to Brooks Road is currently blocked by building works. 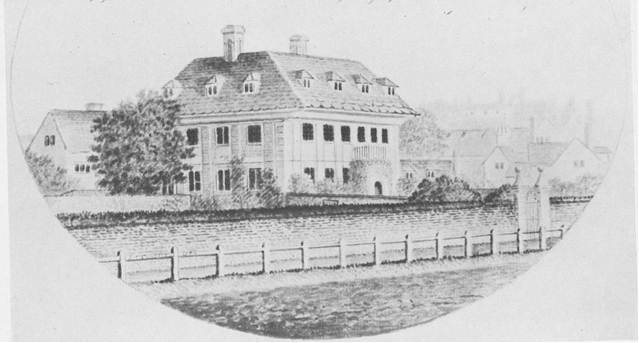 The Friars, Lewes, drawn in 1784 by James Lambert for Sir Walter Burrell. 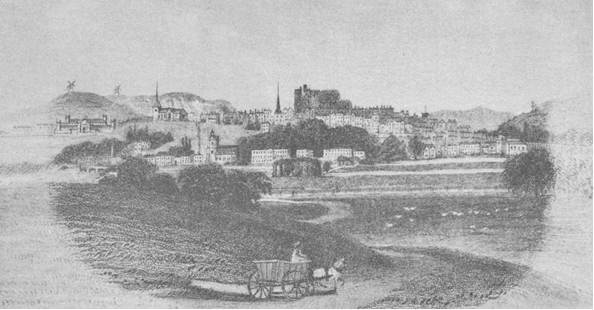 It stood approximately where the Magistrates Court now stands, and Lambert took this view from what is now the pedestrian precinct. 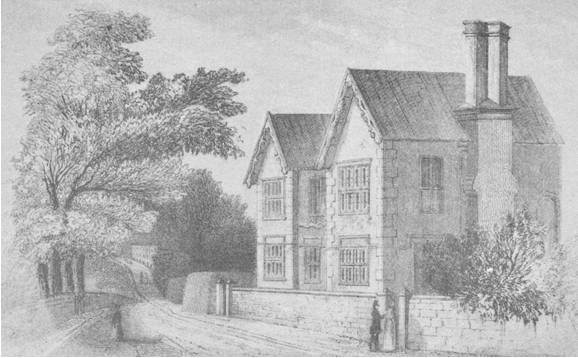 It was built about 1673, and was demolished in 1846 to make way for the first Lewes railway station. In 1784 it was occupied by Sir Ferdinando Poole, baronet, a member of the extended Pelham family and a friend of the Prince Regent, who co-founded the Derby with Lord Rosebery. Sir Ferdinando’s racing stables were at Broyle Gate Farm, Ringmer. Source: This drawing is preserved in the Burrell collection in the British Museum, Add.MSS 5677 f.1 and was reprinted in Sussex Record Society vol. 50. Alecunners of St Michaell, St Peter & St Mary Westout, St John sub castro & All Sayntes, one in each parish. Another passage identifies Aylards Corner as near the broken church, so the present junction between High Street and Market Street. Altogether there seems a commendable emphasis on cleanliness. 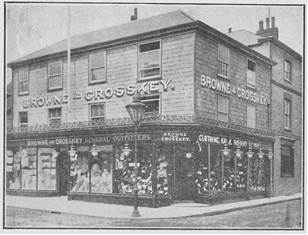 For much of the 20th century Browne & Crosskey’s stores were an important part of the commercial life of Lewes. These images, taken from advertisements in F.W. Jackson’s Lewes guidebook (c.1926) show their drapers, outfitters & hosiers store, at the bottom of School Hill (left) and their furniture showroom on Friars Walk (right). 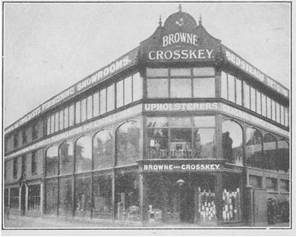 The furniture store also sold floor coverings, glass, china & earthenware, brooms and brushes, and domestic ironmongery. You could also have your mattresses purified and re-made there. Mr Kell, a solicitor, was also clerk to the magistrates, while John Cooke was also registrar of births, marriages and deaths. James Berry was a prominent builder and developer based in South Malling, and contractor for the early phases of Duke of Devonshire’s development of Eastbourne. Thomas Davey led the local Temperance Society. This Victorian print, published by A. Morris, shows a view of Lewes from the south. The prison on the left and the scar of the Brighton-Lewes railway cutting confirm a post-1850 date, but there is no sign of the 1857 railway station at the bottom of St Mary’s Lane. Two windmills on the Downs, and the spires of St Anne’s and St Michael’s are prominent landscape features. Southover and All Saints churches are clearly visible. The tower of St John-sub-Castro rises just above the skyline. This entry was posted in Art & Architectural History, Legal History, Lewes, Local History, Political History, Social History and tagged Drapers, Fellowship of the Twelve, photography, Poor houses, railways, Society of the Twelve. Bookmark the permalink.